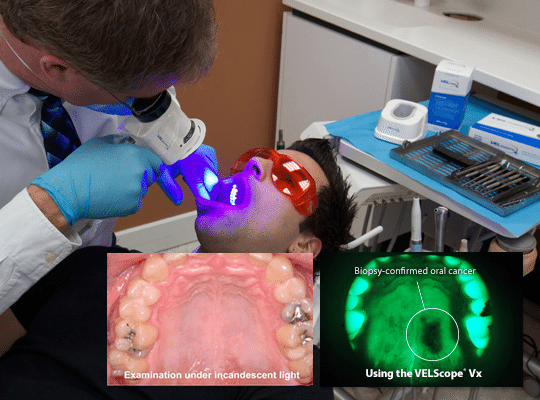 We have VELscope which help us find oral mucosa abnormalities, including oral cancer. 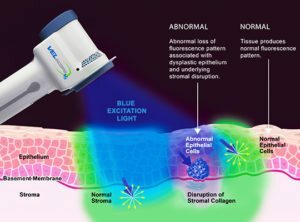 It has been recognized by the World Health Organization as the most powerful tool available for assisting in the discovery of oral abnormalities. Early oral cancer detection on a 5-year survival rate is approximate 83%. Late detection on a 5-year survival rate is approximate 32%. Risk Factors: tabacco and chewing tabacco, along with alcohol, are the leading causes of oral cancer. Over the last four decades, the Human Papilloma Virus(HPV), known for its role in cervical cancer, has been showing up in increasing numbers of oral cancer cases.